Remember V-Rally or Need for Speed: V-Rally? This racing IP was left in some kind of Snow White state for over 16 years, now developer Kylotonn decided it was time to kiss it awake. Known for the WRC-games in the past years I couldn’t think of a better racing developer for this returning franchise. V-rally is much more than your typical rally-game, you will drive a lot of classical rally cars but also powerful buggies. The career mode is robust and has some minor financial manager tasks. Prepare to drive miles and miles of road in beautiful environments and battle with your friends to have the best time on timed events! Stages: Getting rid of the licensed tracks from the previous WRC-games must have been great for Kylotonn, the creative freedom you see in the many tracks is impressive. From narrow paths through a lake, colorful flower beds, dense forests with wildlife, the big open fields from Kenya with zebras and flamingo’s, every track has something unique. What I really liked the most was the bumpy roads with puddles (Hi Spider-Man) or bad road conditions. Stunning visuals: With realistic lighting effects and a silly amount of visual details like driving through bugs, birds that fly by, trees that move with the wind and a lot more makes V-Rally 4 a very beautiful racing game. Long distance views that doesn’t seem to stop, nice looking water and sand effect, one of the best night racing I have ever seen. The list of visuals treats is long, Kylotonn can be proud about what they have accomplished. Career mode: The single player career mode has easy team management and vehicle upgrading. The menus for this are kept simple so everyone can enjoy it, you do need to keep an eye out on your team wages, each week you must pay everyone so you are required to keep your finances in the green. There isn’t a clear task or path but that was actually pretty user-friendly, your events are not based on the result so you’ll always have something new to do. The only real progression you’ll notice is buying cars, you will unlock new tiers with better cars when you pay for example a Mini Cooper. Might be a little weird that you can’t buy everything from the get-go but I liked how it worked. Different modes: V-Rally 4 isn’t only rally, it also features the sensational hill climb discipline, testing your fear of height and driving ridiculously fast next to ravines. Buggy and V-rallycross speak for themselves and you have one very creative mode called extreme-khana. In this extreme car mode you’ll jump on airplane wings, do donuts and drift insane long turns. The healthy variation keeps the game fresh and entertaining, having all these modes in the online play helps a lot too! Attention is required: As with most rally games you really need to sit on the edge of your seat. One mistake and you can say goodbye to your victory, even on the easiest setting. You don’t have a time travel mechanic so the adrenaline while driving can be very high. And the sensation for completing and winning a long track is very satisfying! Online play: Your career mode has a special online hub that shows every timed event. The higher you are placed on the leaderboards the more cash you receive. This easy to use system gives the game lots of replay value! Car handling: V-Rally 4 feels a lot more arcadey than Kylotonn’s previous rally games. It takes a while before you get used to the driving physics, even after playing it for multiple hours I never really felt 100% familiar with the way cars act on the track. Something about weight of the world: The repetitive song that plays in the menus (trust me you’ll hate the weight of the world lyrics faster than anything else) drove me crazy after a few hours. I just don’t get why some developers doesn’t seem to realise that putting a lyrics song on repeat is one of the worst thing you can do. Same can be said about architects that place radiators in the middle of a wall, there seems to be a reason for everything.. I’m just lost about why you play a song over and over again in the menus. 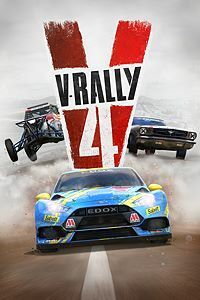 V-Rally 4 [Score 87/10] One of the best rally games I have played on consoles, it seems that Forza Horizon 4 has some stiff competition for the Game of the Year racing award!